I’ve written before about planning a special night out for mom and dad when visiting Disney World. There are so many great restaurants and things to do–or if you’re like me, you grab your husband and head to the parks and ride all the rides your kids are too young to enjoy. 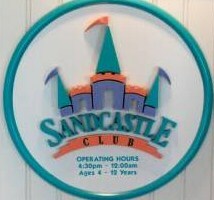 Today I want to review the Kids’ Clubs on property, which are a great way to get a little bit of free time. Disney’s Kids Clubs, known as Activity Centers, are located in the Wilderness Lodge, Animal Kingdom Lodge, the Polynesian, Beach Club, and at the Disney World Dolphin. You don’t need to be a guest staying on Disney property but children need to be between the ages of 3 and 12 (4 and 12 for the Dolphin) and potty trained. The cost is $11.50 per hour; there is no discount for multiple kids. Best Resort Room Options for Families of Five or More. A family of five isn’t a “big” family by any means, but it is by Disney standards, where most rooms sleep four people. Because of this, many families mistakenly believe they won’t fit in a standard room, much less in a value room, when in reality there are some attractive options for “larger” families. Even better, these options don’t have to break the bank. 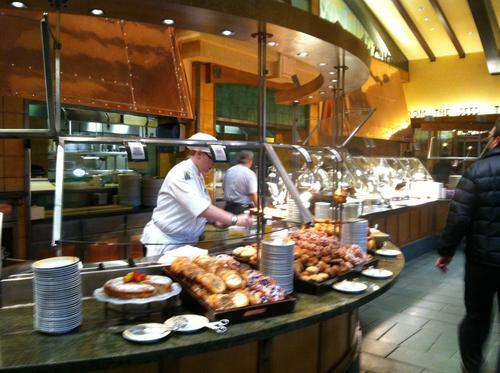 Disney value resorts are the gold standard for guests looking to economize on vacation. The good news is that a value room gives you all the benefits of staying on property at a great price. The no-so-good news is that a standard room in a value resort can be a tight fit, with just two double beds and a small bathroom, and since these rooms only sleep four (plus one child under the age of three), they’re unsuitable for larger families. Fortunately, almost all Disney resort rooms connect, so you can book two rooms for up to eight people. Depending on the ages of the children, parents can have one room to themselves and the kids can share the other room, with the door open between them. This is by far the most economical option for most larger families. When you make your reservation, ask to book your rooms under one reservation number and one deposit. One question I get a lot is “Should I rent a car when I visit Walt Disney World?” If you’re not staying on property, the answer is pretty simple: Yes. 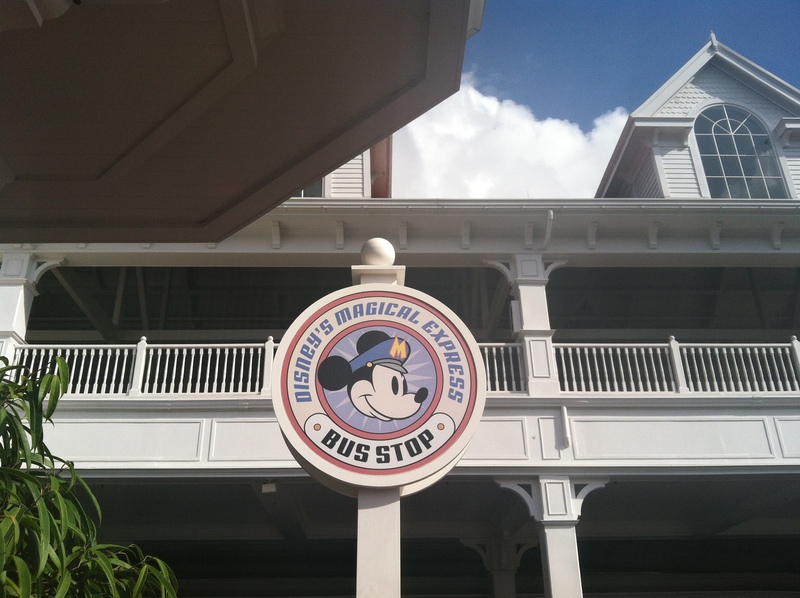 There are no resorts within convenient walking distance of Walt Disney World, even the Downtown Disney resorts, and most resort shuttles are so inconvenient they’ll wreak havoc on your schedule. If you’re staying on property however, the answer is a little bit trickier. 5. Go early. Not only will you save money because breakfast is the least expensive meal of the day, but younger kids are usually at their best in the morning before the afternoon crankies have set in. They’ll also look a lot neater in pictures if they haven’t been running around the parks for hours beforehand. 4. Make your reservations as far in advance as possible to get your top choices. That means calling at 180-days out. It seems crazy to first-timers, but the most popular restaurants will fill up the first week they’re available for booking. If you’re unable to get a desired location, don’t fret. Instead, start checking a few days prior to your trip. Disney’s new cancellation policy means that even the most popular locations may open up 24 to 48 hours prior. Just be flexible about times. I have a confession to make: Disney’s gorgeous pools are almost completely lost on me. Sure, I sometimes find myself dreaming about spending the day lazing around one, it’s just that once I get to Disney World, what I really want to do is spend my time in the parks. And what I mean by this is, all my time in the parks. Not surprisingly, Disney’s pools get little more than a passing glance on the way back from the park in the wee hours of the morning. Oh, pretty. I can swim at home, right? 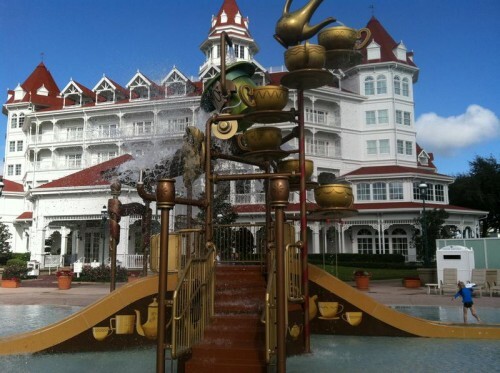 However, stuck on the resort monorail on the way to the Magic Kingdom last fall, I noticed something : The new Alice in Wonderland themed water play area next to the pool at the Grand Floridian. 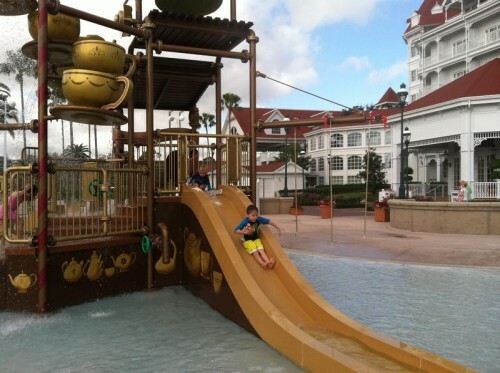 With two slides, a gigantic bucket that fills with water which is then dumped on guests, a shallow splash area, and all sorts of spouts, hoses and sprinklers, this play area intrigued me enough that I booked the Grand Floridian for an upcoming family trip knowing my kids would love it. Use Your Snack Credits Wisely. It happens a lot: You’re hot and tired and without thinking, you grab your Key to the World Card and pay for a nice cold drink using your dining plan snack credits. What’s wrong with that, you wonder? Well, a drink costs around $2.59 and your credit is worth about $5. If you have extra credits to burn, it’s fine to use them on less expensive items like drinks, but if you’re like most people, you’ll want to save those credits for more expensive purchases. In our family, we’ve got a “no drinks” rule when it comes to snack credits. That’s probably the easiest way to make sure you don’t waste credits, but beyond that rule, there are even better ways to get your money’s worth. You’ll get the most mileage out of your snack credits by buying cupcakes, Mickey bars, funnel cakes, and pretzels. Most candies in Epcot’s heavenly ode to all things caramel, Karamell Kuche, are one snack credit, and for that you get a treat that’s big enough to share. 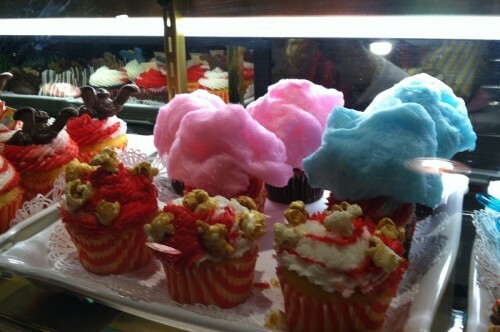 Nearly every elaborate cupcake, croissant, cinnamon roll, and brownie in Hollywood Studios Starring Rolls Bakery is also one credit. If you know you’re going to have a carrot cake cookie for a mid-afternoon snack and a funnel cake with ice cream later that day, you’ll want to find out which item costs more and use your credit for that. It may only be a small amount of money, but over multiple days with multiple people in your party, it can really tip the scale in your favor as far as savings go. Last week I talked about the great character interaction you’ll find at Disneyland Resort, but by far the easiest way to meet characters is by going to a character meal where you’ll bypass the lines and have a much more relaxed experience. For research purposes (okay, I had a 5-year old with me), I tried out three of the five breakfasts available on property and I’m happy to report there wasn’t a bad meal in the bunch. 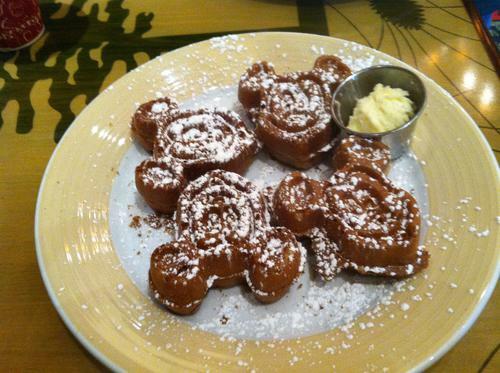 We did this first and I’m glad we didn’t let it scare us off from character dining at Disneyland Resort because it was, especially when compared to character meals at Disney World, pretty quiet and low-key. This is actually a good thing because your kids will probably find it easier to focus on their food without a ton of noise and activity. 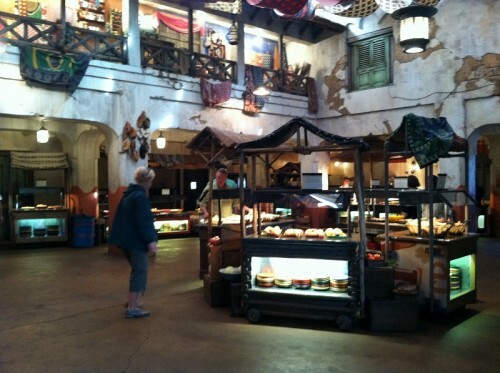 We met Rafiki, Terk, Meeko, Koda, Pluto and Dale, who came back to the table more than once. Since we went in early February, one of the slowest weeks of the year, the dining room was almost empty and the character interaction was top notch, even if my son didn’t recognize all of the characters.